Download our new Opioid Epidemic Infographic to learn how this crisis is affecting every community in the U.S. The Opioid epidemic has hit home. Addiction to opioid prescriptions for chronic pain, such as oxycontin, and street drugs like heroin have caused serious social and economic impacts. Recently, eye-popping opioid crisis facts can be seen on every news headline in the United States. For example, heroin overdoses have quadrupled since 2002 with just under 50,000 opioid-related deaths in 2017. In addition, opioid addiction has cost the United States billions of dollars since the 1990s and the cost in lives continues on an astronomical trajectory. And, so far, many non-community based solutions to the opioid epidemic have come up short. However, given the unacceptable cost in lives and money, some communities are fighting back with innovative opioid epidemic solutions. Opioid Crisis Facts: How Opioid Addiction has Affected the U.S. The opioid tragedy has impacted every community across the country regardless of class, gender, race, or economic status. For example, 52 areas in 45 states have seen an increase of 30% in overdoses within 10 months. The economic impact of opioid addiction cost the United States $504 billion in 2015, according to the Council of Economic Advisers. In a separate study by Altarum, the opioid crisis has exceeded $1 trillion from 2001 to 2017 and they projected an additional $500 billion by 2020. Unfortunately, such opioid crisis facts have become an accepted reality in the United States. However, the impact in human lives has been far more devastating. Between 2002 and 2016, opioid overdoses have increased by 533%. Around 197 people die every day from opioid overdoses in the United States. Approximately 72,000 people died because of opioid overdoses in 2017 compared to 40,000 highway deaths. That is equivalent to one 9/11 every three weeks because of opioid addiction. Not surprisingly, 80% of heroin users started with opioid prescriptions for chronic pain. Yet, to understand the depth of the problem, you need to put these opioid crisis facts into a broader historical context. The opioid epidemic has its roots in the 1990s when pharmaceutical companies reassured the medical community that prescription opioids were NOT addictive. Soon, healthcare providers began to prescribe these “non-addictive” opioid prescriptions for chronic pain at higher rates. Consequently, this led to extensive mistreatment and abuse throughout the country without regard to class, gender, geography, or race. Indeed, it became quite clear that these opioid prescriptions for chronic pain were highly addictive. Once authorities took measures to keep these medications off the street, heroin traffickers were waiting to fill the void. Now, between 2.6 to 5 million people have an opioid disorder. Not only is opioid addiction and overdoses on the rise, but also incidences of neonatal abstinence syndrome. This tragic condition is caused by opioid misuse during pregnancy causing the newborn infant to suffer excruciatingly painful withdrawals. Also, the opioid epidemic has contributed to the spread of infectious diseases, such as HIV and Hepatitis C.
Solutions to the opioid epidemic need to acknowledge that opioid addiction isn’t just a big city problem either. Rural America also has been hit hard by the opioid epidemic. In fact, opioid-related deaths are 45 percent higher in non-metro counties. This is partially because of the high unemployment rates and a greater rate of injuries that lead to opioid prescriptions for chronic pain. For all these reasons, communities need to come together to find innovative opioid epidemic solutions. Opioid addiction affects everyone differently. And solutions to the opioid epidemic should be community-based. There is no one cure-all that will work for every case. While medically assisted detox, professional psychiatric therapy, or nutritional support can mitigate the physical effects of opioid addiction, other treatment therapies help patients comprehend their addictions and embrace healthier lifestyles. Peer-led recovery programs, facilitated by former addicts, has become an effective method of helping others who are struggling with opioid abuse. These programs are so successful that hospitals have brought peer specialists into emergency rooms to deal with overdose cases. These peer specialists believe that solutions to the opioid epidemic should be community-based and led by people with lived experience. Among the different opioid epidemic solutions, peer to peer video counseling can be the answer to a lot of problems. Giving recovering addicts remote access to a peer specialist is a game-changing strategy. This is particularly true in the rural areas where certified peer specialists can be in short supply. Transportation barriers in rural areas are not an issue when all you need is an internet connection, laptop, and webcam. In addition, younger generations may shy away from traditional addiction hotlines but are already familiar with video chat technology. This gives peer to peer video counseling a uniquely ubiquitous advantage in the fight against the opioid epidemic. Recovering addicts can have a remote, face to face conversation with a person with an actual lived-experience that mirrors their own. The opioid epidemic has impacted every community in the U.S. Communities no longer have time to wait and they need innovative solutions to help them fight back. 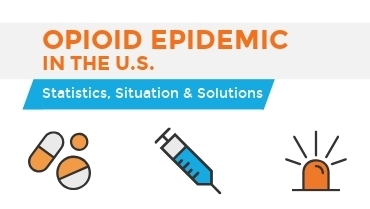 Download our new Opioid Epidemic In the U.S. Infographic to learn more about, the impact of opioid addiction, opioid crisis facts, and opioid epidemic solutions.